Juan-uary is almost here! But if you’re having trouble waiting for The Bachelor premiere just like us, don’t worry — we’ve got the scoop. Here comes the… we mean, come the 27 wanna-be-brides! That’s right, The Bachelor is almost back. This time former soccer player Juan Pablo will step up for the goal, hoping to score a wife. While we can’t spoil everything about the premiere episode, there are a few things you should look forward to. Former bachelor Sean will swoop in with some much-needed words of wisdom before Juan Pablo meets his ladies. They’ll cover all sorts of topics, including Juan Pablo’s trouble with names and his kissing strategy. Juan Pablo looks good in his suit. Unfortunately, we don’t mean his birthday suit, but we do catch a few glimpses of those abs of steel in the introduction. Let’s just say there’s a steamy shower scene, which we know was in there for the sole purpose of giving the ladies a glimpse. We’re not complaining. Juan Pablo handles contestant Clare’s bump with surprising grace and good humor. He also gets quite distracted by her and her pink dress. The two seem to have some serious chemistry right away. But is she really 7 months pregnant? You’ll just have to watch and see. For the first time in Bachelor history, the first-impression rose might not go over as planned. We don’t want to spoil anything, so we’re going to leave it at that. Suffice it to say, navigating through the dreaded waters of overanxious emotion is in full swing even on premiere night. One contestant, Lauren H., will sob before ever having more than a brief introduction with Juan Pablo. Refer to #4 and those dreaded waters of overanxious emotions. Juan Pablo is getting a crash course in estrogen, which might be useful if only for the fact that he has a daughter. Here’s an extra tidbit to get you excited about the season. Juan Pablo is so taken by his ladies he says the words “Oh my God,” “Whew,” and “Wow” nearly 30 times throughout the episode. And that’s not including the rose ceremony, which is yet to be seen. 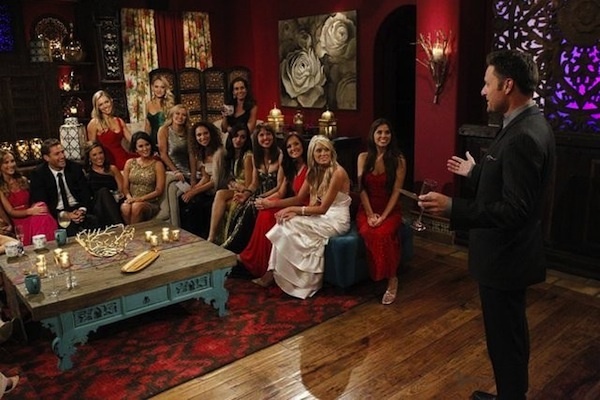 As host Chris Harrison would say, Juan Pablo’s season is sure to be the most dramatic yet! We’ll let you be the judge of that. Suffice it to say, it’s gonna be good. The Bachelor Season 18 premieres Sunday, Jan. 5 and Monday, Jan. 6 on ABC.